Patients tend to have lots of questions about hair transplant procedures and the techniques used to perform hair restoration in Toronto. In response, we have collected some of the most frequently asked hair restoration questions we hear at our office and have listed them here as a courtesy to those interested. Simply click on a question to jump directly to the answer. If you have a question that is not addressed here, please contact our office for more information. What is a true follicular unit graft? How involved is Dr. Cotterill in the procedure? How do I select the best physician for my hair transplant? How is your office different from other hair transplant offices? Do you use a consultant? Are hair transplants appropriate for women? What is “Follicular Unit Extraction” or FUE? What is the “Trichophyltic Closure” technique? What is the status of culturing hair cells to produce an unlimited amount of donor hair? 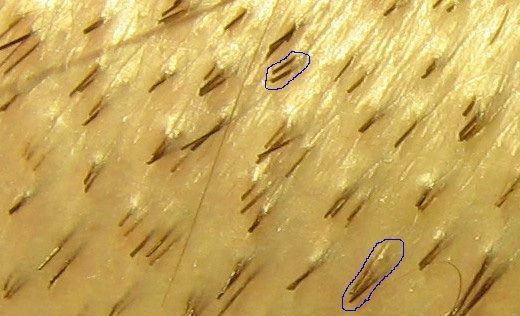 When viewed with a microscope or high powered glasses, one can see that scalp hair grows from the scalp in unique bundles or units, consisting of 1-4 hairs, (on average 1.8 hairs per follicular unit). True follicular unit microscopic dissection is when follicular units are dissected with microscopes into these 1-4 haired naturally occurring units, keeping the hair bundles intact as they naturally grow. There is a small fibrous band around each unit that keeps it together. When a follicular unit of, for example, 3 hairs is further dissected into 3 1-haired grafts, that graft is no longer a true follicular unit but a graft cut down to size. The graft’s integrity is now compromised and there is the concern of graft damage. Follicular unit extraction, where grafts are cut out at the source at the scalp 1 at a time, does not always yield a true follicular unit. This is because the .6 mm to 1 mm rotating drill used to cut out the graft may cut into a follicular unit and only extract a portion of the hairs in that unit. In our office stereoscopic binocular microscopes are used to dissect every graft. Exclusive follicular unit transplantation can be used to treat a bald frontal scalp with 1 session to give a natural feathered hair line appearance. Only 1-haired follicular units would be used to reconstitute a hair line, then adding 2- and 3-haired single follicular units as one goes further behind the hair line. In some instances, to give added fullness behind the hair line, 2 individual follicular units, very close together, otherwise called a follicular unit families, may be employed. The decision to use all single follicular units or a mix of single follicular units and follicular unit families is made at consultation with Dr. Cotterill and the patient. This pic above shows the scalp magnified. Single, True Follicular Units of 2 hairs and 3 hairs are circled. If the true 3-haired single follicular unit (shown circled in the lower right), was dissected further into 3 1-haired non-follicular unit grafts, then the integrity of that graft could be compromised, and as such that graft is no longer a true follicular unit. More and more doctors that perform hair transplants are leaving a lot of the surgery up to nurses and assistants. Please read the Important Consumer Alert put out by The International Society of Hair Restoration Surgery (ISHRS). Some doctors do not remove the donor strip or suture the donor area, or do not make the recipient sites. I take a different approach and have become even more involved in the procedure. I feel it is crucial to the success of the transplant that the doctor see each patient individually in advance of surgery (I do not use non-medical consultants). I remove the donor strip, suture the donor area, make all the recipient sites and assist in planting the grafts. The nurses and assistants in my office will prepare the donor strip and assist in planting the grafts only after I have personally made each donor site. In that way I am directly involved in the angle, direction, depth spacing, and overall design of the recipient area. I do not perform a technique called Stick and Plant whereby the staff make all or most of the recipient sites and plant the grafts. In this way, I am intimately involved in overseeing all aspects of the surgery. When I perform follicular unit extraction, I personally will cut each donor graft and then I will remove the grafts I have cut, assisted by 1 other nurse. The ISHRS is concerned about the use of non-physicians being employed to cut out donor grafts via follicular unit extraction and with the use of non-physicians to operate automated follicular unit extraction devises, such as the various robots on the market today that are not being operated by physicians. I would also like to emphasize that I will only perform 1 operation at a time, and do NOT have other surgeries running at the same time. I see all my patients the following day, I call the patient the evening after surgery when they return to have their hair washed the day after surgery, as well as seeing patients at 1 week when sutures are removed. We will then call patients at 1 month after surgery and at 6 months after surgery to follow-up if the patient has any questions. We will then call the patient at 1 year after surgery to be seen for full re-evaluation and follow up. How do I select the best physician for my hair transplantation? The first pearl of wisdom I would like to share is to take your time. Do not be in any hurry. When you see a physician for the first time bring prepared questions with you, ask lots of questions and see lots of photos. Be sure that the photographs that you are looking at are the ones of the physician you are speaking to, and that they are not retouched. How long has the physician been performing hair transplants? Does he do any other type of surgery? What percentage of his practice is hair transplants? Does he advertise? Spending a lot of money on expensive advertising does not always mean that that physician is any better or worse than a physician who relies on referrals from other physicians or word of mouth from happy patients. Make sure the physician answers all your questions appropriately. Ask to see the offices and O.R.’s. Ask to see patients of the physician. Make sure that the person you are speaking to is the person who will be performing the surgery, and is not a consultant. Does the physician offer different types of grafts and techniques? Some physicians like to perform only one type of graft or use only one type of technique. Because patients’ expectations, goals, hair characteristics, amount of hair loss and future hair loss can differ, what may be best for one patient may not be best for another. I offer different grafting techniques and different grafting sizes and approaches, depending on what is discussed at consultation. Enquire about whether the physician is involved in all aspects of the surgery. With the use of automated machines and robots to make graft sites there has arisen the concern of inexperienced or even experienced physicians delegating the surgical portion of the procedure to non-physicians who will operate these devices. Please read this IMPORTANT CONSUMER ALERT that has been put out by the International Society of Hair Restoration about the improper delegation of surgery to non-physicians. How is your office different from other hair transplantation offices? I have limited my practice solely to hair transplantation since 1986. I lecture internationally on the topic of hair transplantation and have been involved in giving numerous courses to new physicians around the world. I am 1 of approximately 200 physicians who have been certified by the American Board of Hair Restoration Surgery. Just as it is very important for the surgeon to perform all the surgery, it is equally important to have expert assistants assisting the surgeon. As mentioned previously, my office uses only the latest, cutting edge equipment and techniques, including the stereoscopic binocular microscope that is used to dissect every graft. As a result, I am able to offer state-of-the-art follicular unit grafting to all my patients. Some physicians use consultants and others don’t. I am among the physicians who are strongly opposed to the use of non-medical consultants being used either before or after the patient sees the physician. While consultants may speed up the time which the physician has to spend with the patient, I feel that the time spent with the patient is one of the most valuable aspects of visiting the physician’s office for the first time. This is the time when not only the patient gets to know the physician and gets an idea of what can and cannot be achieved with transplants, this is also the time when the physician gets to know the patient and can assess for realistic or unrealistic expectations. A non-medical consultant may not always have the patient’s best interest at heart, but is really just trying to make a sale. I spend anywhere from 45 minutes to an hour with each patient in consultation. I also urge patients to return as often as they like with friends, family members, etc. I also encourage patients to see any of my other hair transplant patients to appreciate firsthand the excellent results that can be achieved with hair restoration. Women also suffer from androgenetic alopecia (female pattern hair loss). I have given many lectures internationally on the subject of hair transplantation in women. A study that I performed* on 827 women over a 10-year period showed that 70% of women in consultation were candidates for hair restoration surgery. Some physicians do not like to treat women with female pattern thinning as they feel they do not make good candidates and have unrealistic expectations. This gets back to a previous comment I made in that it is paramount that the physician take the time at the initial consultation to assess for realistic and unrealistic expectations. In my experience (which includes one of the largest groups of female patients having had hair restoration in the world) properly selected females make excellent patients and have excellent results. The next most common reason for female patients seeing me in consultation is a result of hair loss and scarring after face lifts. This problem is very nicely treated with hair transplants, as are eyebrows that are thin or have been over-plucked in the past. *Application and Approach to Hair Transplantation in Females, The American Journal of Cosmetic Surgery, Vol. 14, No. 2, 1997. What is a “Follicular Unit Extraction” or FUE? A Follicular Unit Extraction or FUE is a relatively new technique whereby individual 1-3 haired follicular unit grafts are removed from the donor area at the back of the scalp or other body areas, such as the chest or beard, 1 graft at a time, using very small 0.8 mm to 1.0 mm circular punches. The benefit of this technique is that a traditional scalpel is not used. The resulting hole when a 1mm punch is used is so small that the hole does not need to be sutured and will heal with a very small scar. Some physicians market this procedure as, “scalpel-less and scar less’. This is misleading since a scalpel is used; not a straight linear scalpel as is used in the more traditional strip excision method, but a circular scalpel (biopsy punch), instead. The skin is still cut and a scar is still made. It is just a very small scar. To be fair, the scar from the traditional scalpel is also very small, if done properly. Please see the International Society of Hair Restoration position paper on: Comparison between Strip Harvesting and Follicular Unit Extraction: A Fair and Balanced View. A benefit of FUE is that there is the possibility of shaving the hair on the scalp very closely down to a #1 or 2 razor. However a very big downside is that in young men with ongoing male pattern hair loss or in men with pre-existing male pattern hair loss, in order to get enough hair using the FUE technique thousands of holes need to be removed from the back of the scalp. The procedure can take 1-2 days, and the entire back of the scalp needs to be shaved. If a patient requires 1, 2 or 3 large sessions requiring 2000 – 3000 follicular unit grafts per session then, as one can imagine, the back of the scalp will begin to look very moth eaten, and scars will most likely be seen when the hair is shaved. Dr Cotterill’s opinion of FUE is that it is a great technique to be offered in certain select circumstances. But FUE is not appropriate for full, large sessions. If a patient requires a very small session, such as to fill in a scalp scar or to fill in an eyebrow, and the patient does not like the idea of a linear (straight ) scar in the donor area. If a patient requires only 1 very small session and wants to be able to shave their hair down closely to the scalp. If a patient has had extensive procedures in the past, has only very limited donor area left, and requires a very small session to the scalp. Body hair transplants, whereby hair is taken from the chest to add to the eyebrows or select area of the scalp or beard. What is the “Trichophytic Closure” technique? When the donor area strip is removed from the permanent hair bearing area at the back of the scalp, the wound is sewn together. Some physicians use staples, others use either dissolvable or non-dissolvable sutures. Dr. Cotterill prefers to use sutures, as he feels they cause less discomfort for patients compared to staples. The wound edges are closed and the resulting scar, in most patients, will heal as a pencil thin scar that is easily camouflaged by the hair at the back of the scalp. Trichophytic Closure is a new technique that Dr. Cotterill uses whereby a small piece of superficial donor scalp is clipped off from one of the wounds 2 edges before they are sewn back together. This technique allows the hair from the clipped edge to grow through the scar, which yields an even smaller, pencil thin scar that in many cases is not even detected on close inspection. If a session of 3,000 grafts are all 1 hair grafts (which equals 3000 hairs) then that may actually represent fewer hairs being transplanted than say 1500 grafts with from 1- 5 hairs per graft, (on average 3 hairs per graft) which would yield 4500 hairs. If the megasession is spread over both the front and back half of the scalp, you may be starting to treat an area (the back half) which, if you are a young patient, would have been better left untreated. You may for example end up having an island of hair with a sea of baldness around it – because the baldness has extended beyond what was originally estimated – and not enough grafts left in the donor region to fix the problem. The more grafts transplanted, the more incisions in the recipient area and the greater the interruption of blood supply to the grafts. If more than 3,000 plus grafts (depending on the size of the area) are transplanted in a single session, some of the grafts may not grow at all, while some may grow fewer hairs than they would have if the sessions were smaller. I will do megasessions only in appropriate patients. For those patients I am happy to perform a session of 2000 – 3000 or more 1-2 hair “micro-grafts”. However, I make it clear to the patient that although this will blend in very quickly, it will produce a somewhat thinner look and may require further sessions to create the sort of density most patients want. Additionally, these operations generally take 5 – 6 hours or more. In the early 1980′s, scientists found that they could remove cells from the base of a growing hair and culture that cell to produce millions of additional cells. This work has been done on mice and rats, whose hair follicles are not much different than humans’. This process has been improperly called “cloning of hair” and should be called “cell therapy”. At several study sites around the world, including Toronto, Canada at the University of Toronto, researchers have been able to identify and grow dermal papilla cells (DPC). For the animal studies, athymic mice whose compromised immune systems are less likely to reject foreign material are being employed. Once these researchers can demonstrate that these cells can produce hairs successfully in such mice, and then in humans, the ultimate challenge is to devise an optimal method for introducing the DPC into the human donor. The end goal, of course, is that instead of depending on a time consuming method of donor hair harvesting and limited supplies of donor hair that we have now, we will be able to have an easily accessed unlimited supply of donor hair. Dr. Unger explains that finding the right cell and the right “food” for that cell took over a year. Similar studies are being conducted in Japan and The Netherlands. Once the cells are reintroduced into the human scalp there is the concern of growing the hair in the right direction and at the right angle. Currently, cells can be removed from a human patient’s hair, multiplied to millions of similar cells and injected into immune compromised mice, which will successfully grow hair. The next step is to gain ethics approval for testing in humans, once the technique has been perfected.